It isn’t the uniform that separates one football player from the others; it’s his talent and heart. 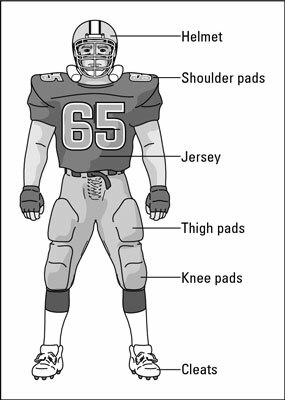 But the uniform and its protective pads are a necessary part of playing football, something any player would be foolhardy to take the field without. Why the need for all this protection? Well, the NFL is made up of players ranging in weight from 150 to 360 pounds and in height from 5’5″ to 6’9″. Some of these assorted sizes are able to bench press 550 pounds and run the 40-yard dash in as fast as 4.2 seconds. Because of the varied weights, sizes, strengths, and speeds of NFL players, the best protection possible is necessary. Smaller players want to be able to play without worrying about being crushed by all those large bodies. The jersey is the uniform’s shirt. The jersey is basically each player’s identity and marks his allegiance to a specific team. The jersey must be large enough to cover the shoulder pads. Every NFL team jersey comes with a different numeral to distinguish one player from another. The numerals, which appear on the front and back of the jersey, are 8 inches high and 4 inches wide. Most high school and college teams have the same specifications, and some also place the number on the jersey’s sleeve. Quarterbacks and kickers wear from 1 to 19. Running backs and defensive backs wear from 20 to 49. Linebackers wear from 50 to 59 or 90 to 99. Offensive linemen wear from 50 to 79. Defensive linemen wear from 60 to 79 or 90 to 99. Receivers wear from 10 to 19 or 80 to 89. On the back of each NFL jersey is the player’s surname in letters that are 2 1/2 inches high. His name appears across the upper-back just above the numerals. The helmet and face mask are designed to protect a player’s face and head from serious injury. Many players also wear a mouth guard to protect their teeth and prevent themselves from biting their tongues. A few players even wear another protective cap on the outside of the helmet for added protection. Chin straps: To keep the helmets snugly in place. Air-filled interior pockets: To prevent serious concussions, many helmets have air-filled pockets inside them. A player tests his helmet by sticking his head inside it and then shaking it for comfort, also making sure that it’s snug. If it’s too tight, he simply releases air from the air pockets. Face masks: The rounded metal material that comprises all face masks can’t be more than 5/8 inch in diameter. Most linemen wear a face mask called a cage, which has a bar extending down from the middle and top of the helmet to below the nose area. There, this bar joins two or three bars that extend from both sides that completely prevent an opponent’s hands from reaching inside the face area and under the chin. However, few quarterbacks and receivers have a face mask with a bar coming between their eyes, because they want to ensure they can see clearly; many also leave the chin exposed. Sunshade: Some helmets have a sunshade across the eyes to prevent sun glare from interfering with the player’s vision. This sunshade also keeps opponents from seeing the player’s eyes, which may give the player an advantage because opponents can’t see where the player is looking. Pads are necessary to absorb the many physical blows a player takes during a game and protect every part of his body. Next to the helmet, the shoulder pads are probably the number-one protective gear players wear. These pads protect a player’s shoulders, plus his sternum region, from injury. Some of these pads also cover the top of the arm and the rotator cuff. Other pads include thigh pads, elbow pads, hip pads, tail pads, and knee pads, although not all players wear them. Some quarterbacks even wear flak jackets to protect their rib cages, which are vulnerable when they lift their arms to throw the ball. Conditions on the field: The shorter cleat, which makes a player less prone to injury, is worn on dry, firm fields because it provides the ideal traction for these fast fields. On a slippery grass field, a player — especially a big lineman across the line of scrimmage — needs to dig deep to gain traction. In that situation, the player switches to a 3/4- or 1-inch cleat, depending on how he’s maneuvering (stopping and going) during warm-ups. Position: Receivers and running backs often wear shoes with fewer cleats than the larger, more physical players do. Field material: For artificial surfaces, most players wear a shoe that has a sole of dozens of rubber-nubbed, 1/2-inch cleats. Some linemen prefer a basketball-type shoe, especially on indoor turf where there’s no chance of rain and the surface isn’t as slick. Because artificial surfaces tend to be sticky, players want to be able to glide over the surface. They don’t want to stop on a dime and change directions. Many players believe that instant stop and restart can be hazardous to their knees and ankles.